Last night, my birthday dinner was mostly cheese from The Cheeseboard in Greenwich. 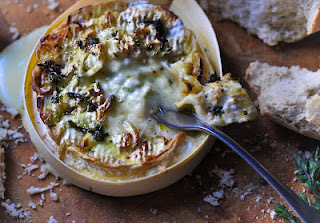 There isn't much else I plan on doing over the next few months than smothering winter in cheese (heck, I could even make my own) so here are our top ten cheese recipes. Tartiflette. We still haven't eaten enough tartiflette. We probably never will. Fondue. What's better than melted cheese and booze? Lasagne-stuffed courgettes. Take one humble courgette, add cheese, make it magic. Baked Camembert. It's only Tuesday?! Shove this in your face the second you get home. Goat's cheese, sun dried tomatoes and basil muffins. Savoury cake is always a winner. Especially with added cheese. Or you could put your goat's cheese in a salad. We've got mozzarella muffins as well. Cheesy beet gratin. We're mad for beetroot at the moment. Crispy pancakes. These are a gluten free slice of our childhood. Silton-stuffed chicken. We love putting Stilton in everything. Pie, pastry, soup. Even cheesecake. Hot cross baked cheesecake. This has so much cinnamon in it, you could totally turn it into a Christmas cheesecake. Crunchie Cheesecake. Yeah, you read that right. And it's gluten free. Or you could make this gluten free white chocolate cheesecake. But this no cheese cheesecake has no place in a cheese top ten. Hell no. Make these cheesecake brownies instead. See more of our top ten recipe posts! Photo by the super talented Hazel Paterson. And you wonder why I live in Switzerland. We didn't forget it, we just don't have a recipe for it.